Some of Seoul’s specialized private high schools may lose their status as part of the Seoul education chief’s drive to level the playing field for students. The Seoul Metropolitan Office of Education was set to announce Wednesday the results of an assessment it conducted on five of the 29 foreign language and autonomous private schools across the city. The review was conducted with the aim of deciding whether to cancel Seoul Foreign Language High School and four other schools’ designations as special institutions. Seoul is home to nearly half of the nation’s autonomous high schools as well as many other specialized private schools, which are considered by many to provide unfair advantages. If the Seoul education office decides to push to cancel the special status of selected schools, it would be a second attempt. 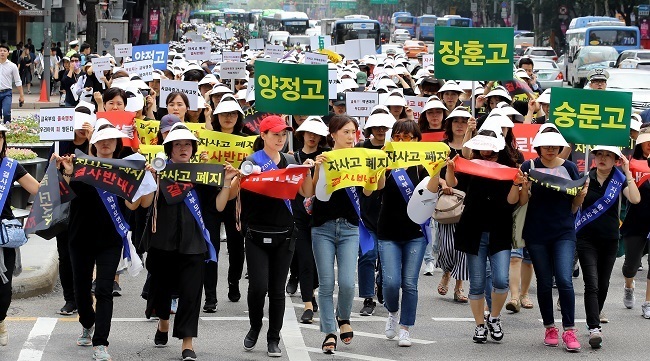 Seoul’s education office had decided to revoke the status of five autonomous institutions in 2015, but the move was blocked by the Ministry of Education under the previous conservative administration. Under the progressive Moon-Jae-in administration, the elite institutions are expected to face a tougher road ahead, as President Moon has pledged to shift away from elitism toward equality. “The current education system (of private high schools) has departed from the initial purpose of creating diversity and autonomy in education to providing training designed to enter top-tier universities,” Seoul Education Superintendent Cho Hee-yeon told Yonhap News Agency on Tuesday. The city’s upcoming decision is likely to trigger other provinces to follow suit in stripping the country’s elite private schools of their autonomous status.